Taipei City (Chinese: 臺北市) is the capital city of the Republic of China, known by most people simply as Taiwan. It is the fourth largest city in Taiwan. It has a humid subtropical climate (Cfa in the Köppen climate classification). Its population in 2014 was about 2.7 million people. Its mayor is Ko Wen-je. Taipei is the political, economic, educational, and cultural center of Taiwan island, and one of the major hubs of Greater China. Considered to be a global city, Taipei is part of a major high-tech industrial area. Railways, Taipei Metro, high-speed rail, highways, airports, and bus lines connect Taipei with all parts of the island. The city is served by two airports – Taipei Songshan and Taiwan Taoyuan. Taipei is home to various world-famous architectural or cultural landmarks which include Taipei 101, Chiang Kai-shek Memorial Hall, Dalongdong Baoan Temple, Taipei Zoo, National Taiwan University, Hsing Tian Kong, Lungshan Temple of Manka, National Palace Museum, Presidential Office Building, Taipei Guest House, Ximending, and several night markets dispersing over the city. Its natural features such as Maokong, Yangmingshan, and hot springs are also well known to international visitors. In 1626, Spanish people took over and started to spread their religion. The Dutch moved out Spanish and took over their fortresses than the Dutch started their trading business. In 1661 Koxinga came to Taiwan and expel the Dutch. And he started to reclaim Taiwan, used a system called Tuntian (a state-promoted method of agriculture), it successfully help Taipei to grow more food. Taipei officially became part of the Tianxing county of China. In 1683 Taiwan got marked as part of the Qing Dynasty. Therefore, a lot of Chinese moved into Taipei, so there were many villages and streets formed, like the Mengjia, Shilin Street, Xikou Street and Dadaocheng. Dadaocheng is a place that produces tea, it has an important impact on how Taipei became prosperous. It was the biggest external trade port that . Foreign countries started to set their business stores in Taipei. Taipei City is divided into 12 districts. Among the notable one is Tamsui. ↑ "Demographic Overview". Taipei City Government. Taipei City Government. December 11, 2015. Retrieved April 26, 2016. ↑ "Taipei's History and Development". Taipei City Government. Taipei City Government. 31 Oct 2016. Retrieved 21 May 2017. ↑ "Taipei History". World Travel Guide. World Travel Guide. Retrieved 21 May 2017. ↑ "Taiwanese History". Taiwan's History. Taiwan's History. 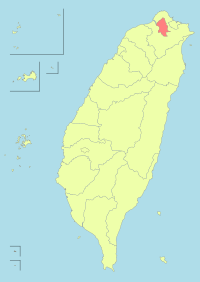 Wikimedia Commons has media related to Taipei.